Michael Flatley first stepped onto the world stage in 1994 when he created Riverdance. He unveiled his new show Lord of the Dance in 1996 and began a world tour that would break box office records in 5 continents. His name and Lord of the Dance brand have become synonymous with spectacular artistry and grand scale productions that have mesmerized audiences around the globe. He has created, directed and produced several successful shows including Lord of the Dance, Feet of Flames and Celtic Tiger. In 1998 Lord of the Dance set a record breaking run of 21 shows at London’s legendary Wembley arena and worldwide video sales were in excess of 12 million copies. Feet of Flames was the first show ever to be performed at London’s historic “Route of Kings” in Hyde Park. This show reached new heights as Michael took it to stadia filled to capacity at 120,000. Celtic Tiger debuted in 2005 and began a new era of dance which combined tradition with an international flare. 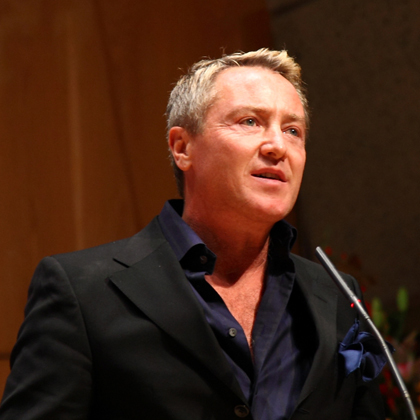 Michael Flatley is also a master flautist for which he has won many All Ireland titles. Michael has set many Guinness World Records for his phenomenal speed at 35 taps per second and has been recognized by many establishments and received countless awards for his contribution to the entertainment industry and the promotion and enrichment of Ireland, Irish Dance and Music. His support of many causes over the last two decades has aided and encouraged countless people to embrace his motto “nothing is impossible…follow your dreams”.